You know that feeling when you see a movie and you get inspired to go on an adventure? My Dad does sure did and thanks to that our family lived our own version of National Lampoon’s Vacation. Back in 1985 my Dad put a vote to our family asking how we felt about moving back to Ontario from beautiful British Columbia? The people spoke and the next thing you know the wheels where in motion to migrate East. The part we didn’t learn about until after the vote? #roadtrip ! I never really thought about how we were going to get there until that moment. Then it hit me; My mom and dad, us 3 kids, a cat, a dog and all the stuff we can carry in a station wagon towing a hand crafted trailer 4300km across the country, what could go wrong? Turns out, pretty much everything. We made it from Langford to Duncan, or a gruelling 48 km and took our first u turn so to speak. Turns out we would be staying the night while a little problem with a tire was tended to. No worries, one day longer to get to our destination, we’re flexible. Once on the road again we made it nearly the full 89km to my uncles, when we encountered another minor set back. This time due to a little bend in the frame of our trailer. A quick sale at rock bottom prices of our appliances and problem solved. Alas we made it to our last stop, said good bye to our family and left my favorite island on the planet, Vancouver Island. The rest of our journey east was pretty uneventful until we started to climb the Rocky Mountain Foothills. It was about this time we realised the car preformed better driving at night when it’s cool vs. during the day when it was hot. Unless of course you like radiator steam baths. No problemo. Children of the ages 3, 11 and 13 are so cooperative when it comes to managing major time table changes. Once we made it to Kenora Ontario it was time to shake things up a bit. Literally! That is exactly what happened when a tire blew off our trailer. Bless my mom, she handled that full stop like a stunt driver. Between the exploding rubber and the subsequent skid to a halt, the trailer doors blew off and our belongings spilled all over the Trans-Canada Highway. After a brief game of dodge the transport trucks we had our belongs retrieved and the trailer detached. The plan? My dad waits on the side of the highway while us four girls drive to the closest town to get a tire. Sounds reasonable, my dad on the road guarding the trailer, while my mom, who has no sense of direction and us three girls look for a town. Luckily no horror story here, after three hours we were reunited and on the road again. 6 days and 5 nights later we arrived safe and sound at Grandma’s in Etobicoke. Starving we were grateful for the home cook meal she had planned for our arrival. Sadly we didn’t have cell phones back then and couldn’t tell her we would be five hours late. Those burgers would have been perfect if slider buns were a thing back then. Can anyone say “Where’s the beef” ? Strapped in the car with my sisters and parents for all those kilometers, bouncing across the country under the cover of darkness, I realised some things. My home and native land is spectacular, day and night. The Northern lights coupled with an electric storm is not the time to misplace the camera. A Ford Torino towing a hand crafted trailer through the middle of Winnipeg bounces better than any blow up castle. Engines that overheat also double as heat warmers without a max temp setting. Keep the windows rolled up when travelling with a cat. Small dogs that pick fights with enormous dogs teach you to run fast and start the car even faster. But more than anything I realized being locked in the car with the the people you love for days on end is the stuff that the classics are made of. 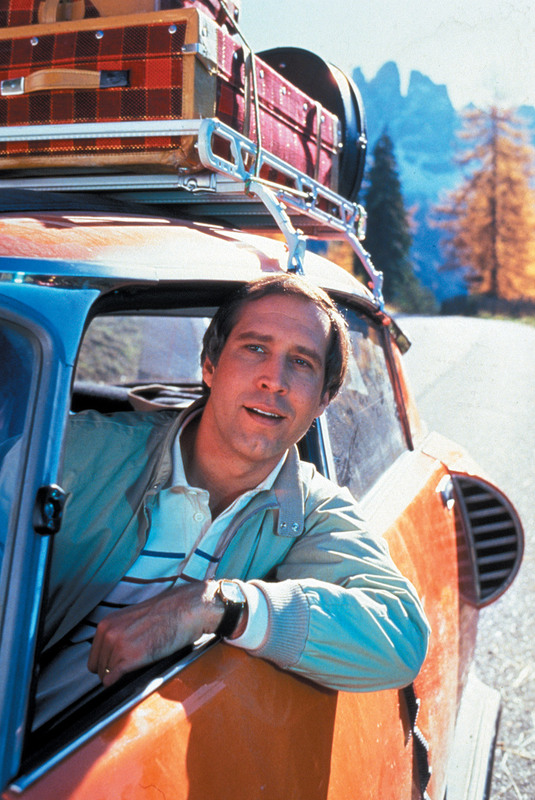 And if your dad plans an adventure after being inspired by a Chevy Chase movie, you strap in and hit the road! Too funny! All these years I never knew the details of this epic road trip. Thanks for sharing. Heading out on my own road trip in 7 days. Hoping to make some awesome memories to laugh about in the years to come . Love ya!